This weeks blog is about some of the Ancient Egyptian models I have made. 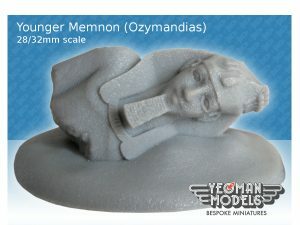 First up is the Younger Memnon statue ruin. 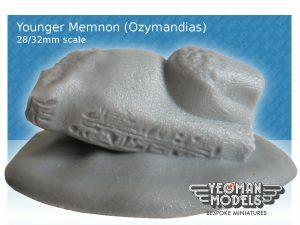 I have also made the Younger Memnon as it is today with a hole in the chest and you can see him on Shapeways. Also, some new items of ancient Egypt are for sale. A 28/32mm scale column ruin that measures 5cm high (so is ideal for your 28mm scale explorer to hide behind) and a wall carving both of which are covered in hieroglyphics and Ancient Egyptian imagery.